The standard Black & White three-stage system. Go here for full unit dimensions. 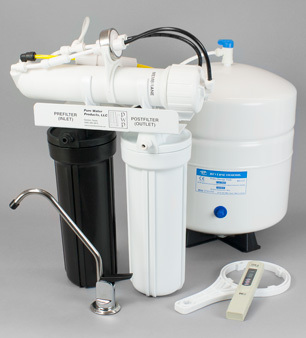 See also our Reverse Osmosis FAQ. All installer connections are with John Guest or Mur-lok Quick-Connect fittings. Just push the tube into the fitting. No tools needed. Our Black & White Series Reverse Osmosis units have been sold and installed in the Denton area since the early 1990s and have been shipped to our out-of-town customers since the mid-1990s. We've continued to improve our basic design, so that our Black & White unit is now the most easily installed and reliable standard reverse osmosis unit available anywhere. Instructions are short and precise; phone support is free. Reverse Osmosis is our main product. We consider it to be the most complete and effective home drinking water treatment. It provides very high quality water in a convenient delivery system, at a reasonable initial cost and with only moderate upkeep. 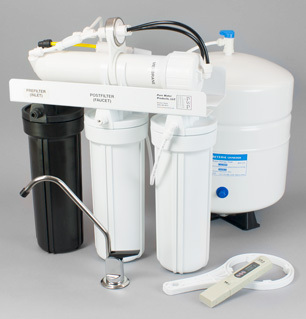 A typical home reverse osmosis unit uses activated carbon filtration to remove chemicals, bad tastes and odors, along with a very tight semi-permeable membrane to reduce “dissolved solids” like sodium, and heavy metal contaminants like lead, aluminum and arsenic. 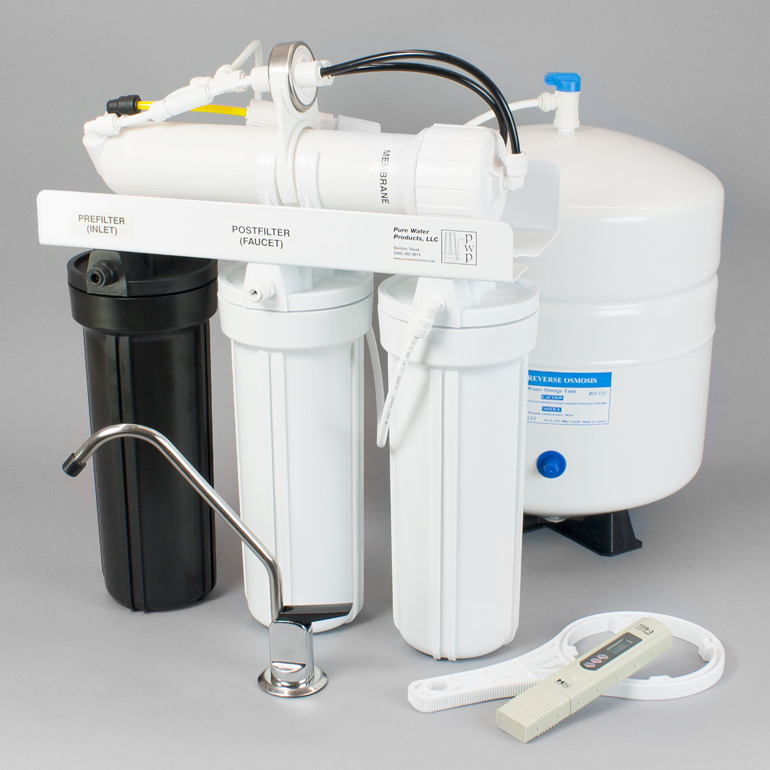 Unlike most standard water filters, RO units will also remove fluoride and nitrates. For overall performance, see related article. MatriKX extruded carbon blocks (much better than RO filters have to be). Reliable and effective Filmtec thinfilm membrane, or the innovative Pentair GRO membrane for our 50/50 series. Tomlinson Pro-Flo ledge faucet, with pre-installed tubing for quick installation. Ultra-reliable Payne control system that shuts the unit off when the storage tank is full. Tough, heavy-duty filter vessels and membrane housing built onto a strong, steel frame. John Guest tubing joined together with o-ring sealed quick connect fittings for leak-free performance and ease of installation. A top-quality NSF certified metal storage tank. Order the standard three-stage unit if you'd like the one that we recommend to most customers on municipal water supplies. During checkout, you'll be asked to provide information about your cold water undersink setup and faucet preference. Standard three-stage unit. Complete with all installation accessories and a TDS tester to monitor the performance of the membrane. Inlet valves connect your water filter to your cold water faucet line. Choose the option that matches your undersink plumbing. Inlet adapter for flexible cold water pipe. (Most common.) Inlet adapter for copper cold water pipe. Tomlinson Pro-Flo is the standard option — it's a basic design, but dependable and sturdy. All Tomlinson faucets are of exceptionally fine quality, with smooth and easy handle action and spouts that swivel 360 degrees. Tomlinson Contemporary “Value” is another standard option. It's a light-bodied version of the top-of-the-line Contemporary style, with a 1/4 turn handle. The Tomlinson Designer Faucet is an elegant faucet of superior quality that's designed for years of service. This unique faucet, which uses a quarter turn ceramic disc valve, is as functional as it is beautiful. The Tomlinson Contemporary Faucet is a heavy bodied, top-of-the-line faucet that’s created to be both durable and beautiful. This faucet is designed for many years of trouble-free service. Choose a color / finish for your Tomlinson Designer Faucet. Choose a color / finish for your Tomlinson Contemporary Faucet. Standard three-stage unit with Aquatec Permeate Pump to improve membrane efficiency. 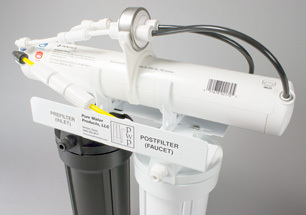 Complete with all installation accessories and a TDS tester to monitor the performance of the membrane. Our Black & White: 50/50 Series offers an environmentally-friendly alternative to traditional reverse osmosis units. We consider reverse osmosis to be the best home treatment for drinking water, but nothing is perfect. One imperfection of reverse osmosis is that it uses more water than what ends up in your cup — often, quite a bit more. A standard undersink reverse osmosis unit will send, at best, about four cups of water to drain for every cup of purified water produced. “At best” means when the storage tank is empty and not putting back pressure on the membrane. As the tank fills, back pressure makes the ratio of product water to drain water worse. Our Black & White: 50/50 series units change the 4:1 ratio to a genuine 1:1. A gallon of product water goes into the storage tank for every gallon of reject water that flows to drain. This 50/50 performance is achieved by using Pentair's exceptional new GRO membrane. With the GRO, greater membrane efficiency allows the use of less drain water to keep the membrane clean. So, why don't we just use GRO membranes on all Black & White units since they save water as compared with conventional membranes? It's because with extreme water conservation you give up a bit of TDS performance. Although the GRO is a top performer and makes superb drinking water, its rejection rate of “dissolved solids” is about 2 percentage points less than that of Pentair's conventional membranes. 96% vs. 98%. As we said, nothing is perfect, but as a practical reality you won't notice the slight TDS performance difference and you will use a lot less water. All around treatment for city & well water. Final calcite post-filter neutralizes pH and remineralizes with calcium & magnesium. Filox pre-treatment improves membrane arsenic removal performance. Final DI cartridge provides high purity 0 to 1 PPM TDS. The four-stage version of our Black & White unit, available for the same price as the three stage. Actually, 5-stage systems aren't any better than three, unless there's a reason for the extra stages. Mass merchandisers build big systems with extra stages for several reasons. They're building for a national market, so they throw in a little something for everyone. For example, a pre-sediment filter is necessary if the unit is to process well water that has sand in it, but for most city water customers the sediment filter is just a bother and an added expense to replace. The store-clerks who sell the systems usually don't know much about them, so the manufacturer builds something that looks impressive to the buyer. Bigger is assumed to be better, and five-stages must be better than three or four. The result is a unit that has to be serviced often (cheap cartridges don't last long), is hard to service (you have four cartridges to replace rather than two), and has a lot more things that can go wrong. What we prefer is to build the unit according to what you need and want. We start with our basic three-stage system, then add anything else you might need. Cartridges can be added or substituted as you wish without changing the basic unit price. Built to order. Complete with all installation accessories and a TDS tester to monitor the performance of the membrane. Filter Substitutions. If you have special requests for filter cartridges, we'll substitute whatever we have in stock at no additional charge. For example, if you have iron in your water, we'll give you a KDF-based prefilter or perhaps a Filox to protect the RO membrane from iron. Or, if you want all coconut shell carbon filters, we'll supply them. We have specialty cartridges that remove bacteria, deal with chloramines, or increase the pH of water leaving the RO unit —lots of choices for special needs. Plumbing Extras. If you need a tee to hook your refrigerator to the RO unit, just tell us and we'll supply it. We also have a great John Guest refrigerator connector that lets you hook to the back of your refrigerator without so much as a wrench. We'll also throw in inline valves, extra tubing, etc. If you'll describe your installation, we'll include everything you need. If you want to assure that your water is absolutely bacteria free, we'll add a Doulton Sterasyl cartridge after the last carbon filter. It's a 99.999% bacteria remover. You'll never have to replace it. But, like everything else, it has disadvantages. It's so tight it will cut the pressure of the water you get from the faucet some, and you'll have to clean it once a year. (Not a hard job, but sometimes messy.) Please note that if you want a ceramic added as one of the regular filters of the RO unit, there's no charge. The Add-On unit below is in addition to the regular RO unit. If you prefer ultra-violet treated water, we'll add a Sterilight Copper UV lamp as the final stage. The purpose — the only purpose — of ultraviolet treatment is to assure that the water you drink is absolutely bacteria-free. Go here for pump picture and information. This is a special non-electric pump that gets its power from the RO unit's brine (drain water). It's a great performance enhancer. It's especially valuable if you have low inlet pressure. No matter what your water pressure, it puts a lot more water in your storage tank and improves efficiency in many ways. Although the permeate pump can be added to an existing RO unit, it's much easier to buy the unit with the pump installed. (The Aquatec electric pump above can be easily added to existing RO units — ours or anyone else's.) You won't need a source of electricity for this pump. Go here for pump picture and more information. 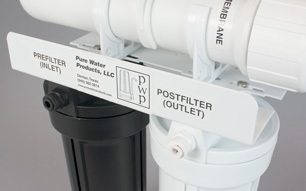 Need parts for your reverse osmosis unit? Visit our parts page.